Photo of Allium sativum L.
Perennial plant of the Lily family Liliaceae – up to 1,5 m. Flat leaves till 8 mm wide. Greenish or whitish flowers, sometimes rosy, not very abundant (sometimes lacking) that stand out with their long peduncle on a head of little bulbs, surrounded by a very long spathe. 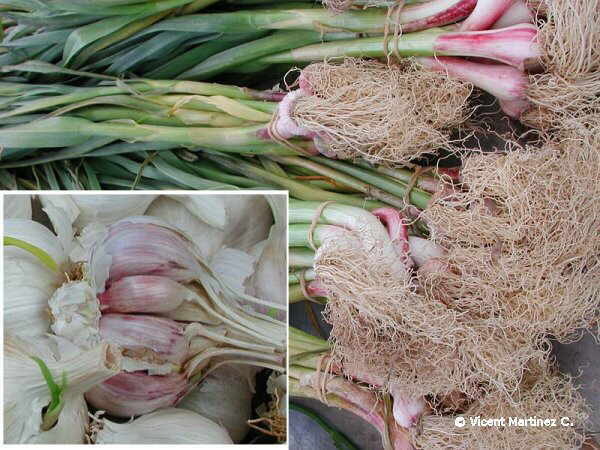 Bulb of garlic formed by a white cover inside which there are several little bulbs (cloves). It is known from remote times, being you used by most of the cultures, from the old Egyptian, Roman, Greek until in the same India or Middle East. It seems that its origin is located in central Asia, from where it extended widely. It doesn’t appear naturalized.